Product information "Smeg FAB28RBL3UK Black Retro Fridge Right Hinge"
This Smeg FAB28 retro fridge will make create a focal point in any kitchen in its gloss black finish. The FAB28 is not only stylish but it's practical too: has an energy rating of A++ and a large 256L capacity. All this combined with their iconic design makes them a must have. The FAB28 is made from durable steel, laser cut to perfection which fulfils Smeg's philosophy of using only top of the range materials. Combine this with its cool 50's style design and this fridge would look perfect in any kitchen from a high end city apartment to a traditional cottage kitchen. Smeg never disappoint on features either with its 222 litres fridge, 26 litres ice box, automatic defrost, 3 adjustable shelves, 1 fruit and vegetable container, 1 covered storage box and a drinks rack. Please note: a gap of 175mm must be left on the hinged side of the product to allow the door to open. Also note that the door cannot be reversed so make sure you order the door the correct way round! 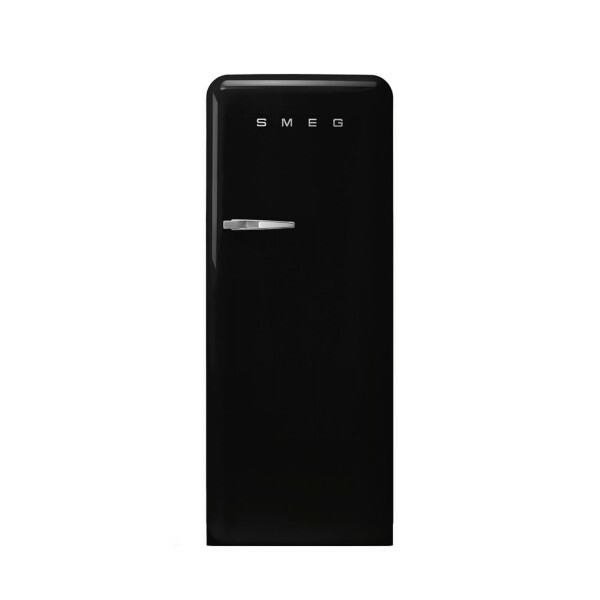 Related links to "Smeg FAB28RBL3UK Black Retro Fridge Right Hinge"
Customer evaluation for "Smeg FAB28RBL3UK Black Retro Fridge Right Hinge"